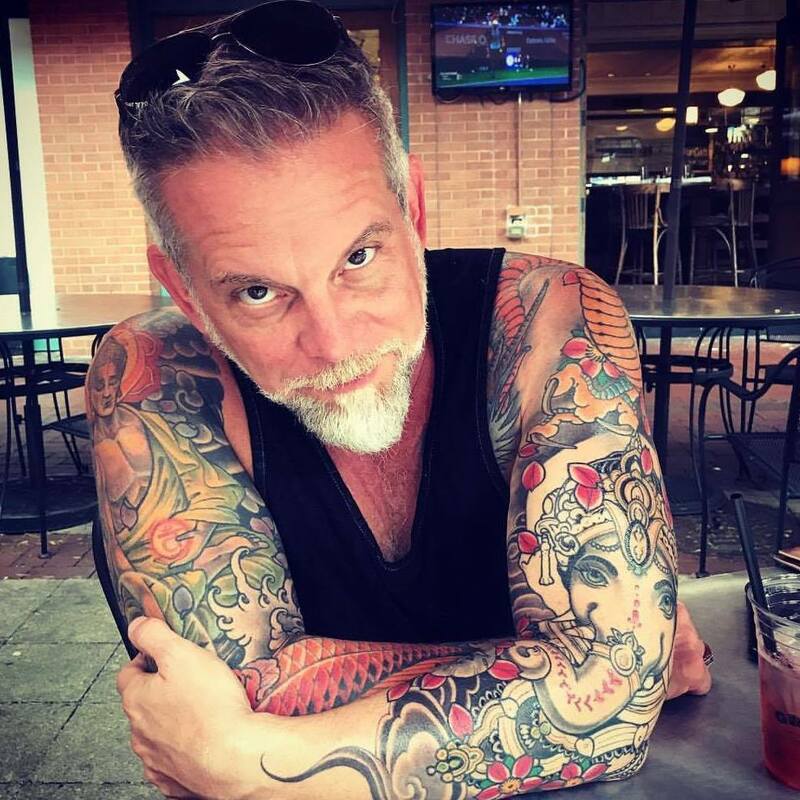 Remarks delivered in Pecha Kucha style (20 seconds per slide) at the Orlando B.I.G. Summit, 18 Nov 2010. Blasting through the sky at 30 thousand feet in a pressurized metal tube… is a lot like life. And it’s also a lot like business, depending on your willingness to overtax a metaphor. 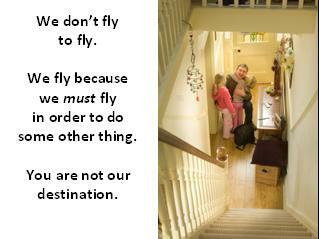 What lessons for life and business can we draw from our common experience of flying? I’ve considered a few. The first vignettes I’ll discuss are life lessons drawn from my experience as a passenger. For the next few moments, visualize yourself, your company, your family, your community, everyone in the room, as the passengers on this headlong rush through life into what Shakespeare (and Star Trek) called the undiscovered country. 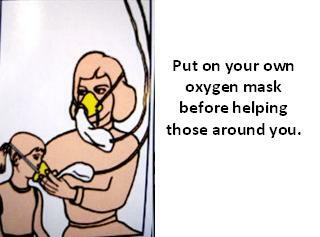 Put on your own oxygen mask before helping those around you. You’re no good to anyone else if you’re dead. I represent a lot of startups. Sometimes they ask me to work for free. Much as I’d like to, as strong as the instinct may be to help, if I don’t get paid I’ll go out of business. 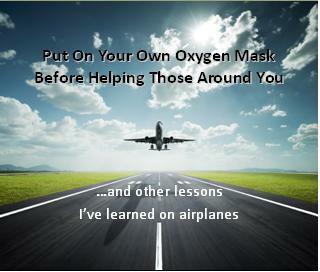 And if I go out of business, I’m not around to help anyone put their oxygen mask on. Bad things, annoying things, will happen to you from time to time. Things over which you have no control. 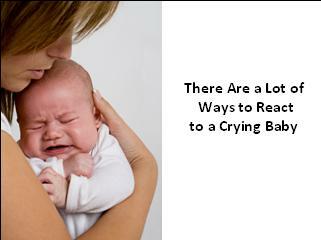 You can allow them to frustrate you. Or you can celebrate that as a highly organized matrix of the slime growing on a rock floating in the inky blackness of space, it’s pretty much a miracle that you’re even here to feel anything. 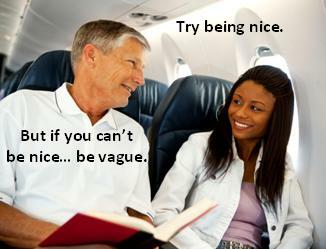 Putting your own oxygen mask on first is selfishness that begets altruism. Other selfish acts are just plain selfish. Don’t pee in my pool. Don’t merge into my lane without looking to see whether I’m already there. 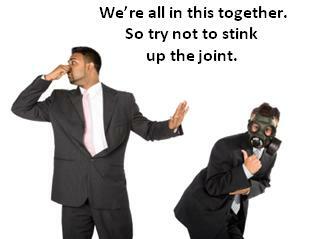 Don’t pollute the environment, with your words… or your winds. We are all in this together, and we have very little control over most of the trip. One thing you do control is your own treatment of those around you. When the trip ends, let it be said that in the balance you created more joy than suffering. You make the choice to have that impact with every word and every gesture. Consider that the promises you make in life are like the airplane door closing. You have a world of infinite possibilities open to you when you board and sit down. But when that door closes, you have moved past your point of easy exit and you are rather fully committed to the trip you’ve chosen to take. In these next few vignettes, you and your company are playing the role of the flight crew, and we the passengers, we are your customers. 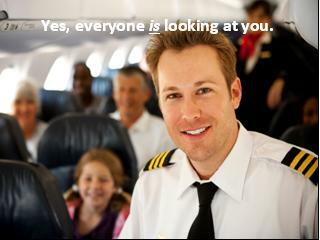 So think of yourself as the pilot or flight attendant and the rest of us as your paying customers or clients. 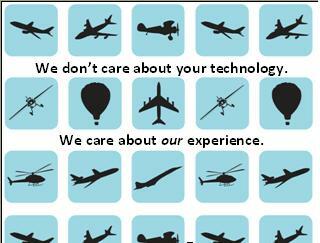 The trip we’re on is the sum total of our experiences using your product or service. Your gadgets might be fancy. Your internal effectiveness initiatives might be the stuff of MBA legend. But we customers just want results. The iPhone is an amazing piece of tech that magically fell to earth from the future, but that is not why we are obsessed with it. We are obsessed with it because it is beautiful and it brings us joy. Unless your product is in fact a destination unto itself, such as a resort hotel or, say, a novel, please understand that we are only using your product to achieve some other goal of our own. Just because we patronize you doesn’t mean you’re anything more than a necessary evil. At the Ritz Carlton in Half Moon Bay, California, they have a guy come out and play Amazing Grace on the bagpipes as the sun sets over the Pacific. It’s like chocolates on your pillow times a million. You can create moments like that. 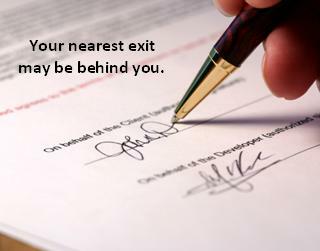 In fact, you have the opportunity to do that with every customer interaction. 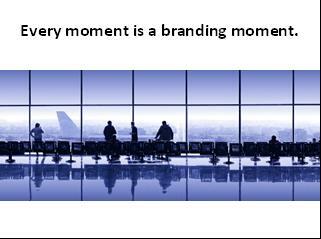 Every word you say and every gesture you make, every customer touchpoint is a branding moment. Very few things of value happen without the focused, committed, even fanatical devotion of a few obsessed people making herculean efforts over a sustained period of time. 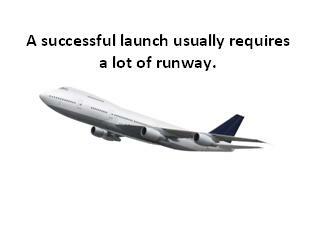 Most launches are horizontal before they are vertical. Rocket rides are few and far between. If you are going to lead, lead from the front. No one can be more knowledgeable about your company than you. No one can be more passionate about your company than you. No one can understand how to drive your company better than you. You do not lead from behind. 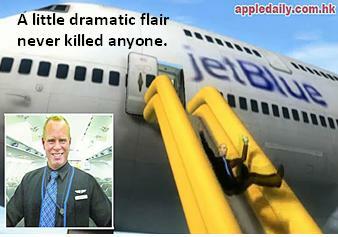 Steven Slater, the Jetblue flight attendant who decided he’d had enough? He broke all rules in high drama and got himself on Larry King. Always consider going for the Hail Mary because if you miss it, well, hey, it was a long shot, but if you make it, the crowd goes wild. 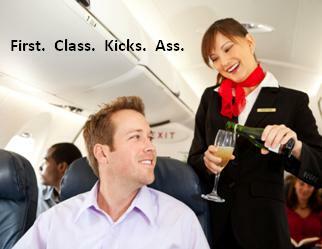 Do your customers feel like they are flying in your first class cabin? Which of your customers feel like they are sitting in a middle seat in row 35 next to the bathroom? Which of your customers took another airline altogether? I get a report every day showing me the financial condition of my law practice to the penny. It doesn’t matter how I feel about the work. 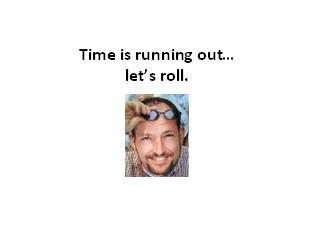 I can feel very productive, I can tear it up with new clients at my next conference. 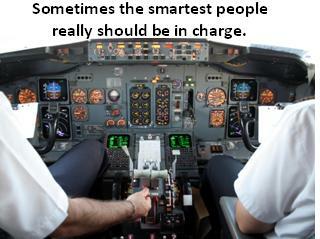 None of that matters if I’ve veered off my flight plan without noticing it. 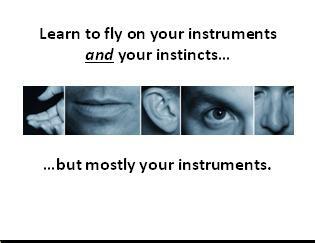 Heed your instincts, but measure your performance objectively and trust the dispassionate metrics. A CFIT is a Controlled Flight Into Terrain. Accidents happen. 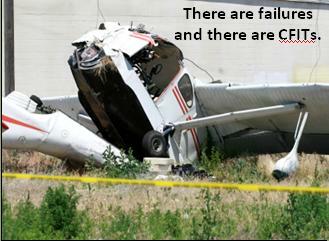 But there’s no excuse for flying directly into the ground because you failed to read your altimeter or trust your gyroscope. 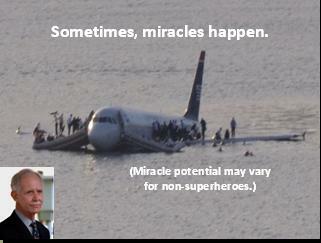 Miracles happen where opportunity meets preparation and expertise. Mark Bingham was a friend of a friend who I never got to meet because on Sept 11, 2001, Mark and his fellow passengers flew United flight 93 into the ground to prevent it from flying into a building and possibly killing thousands. Sometimes when the stakes are high enough, it turns out you just can’t worry about your own oxygen mask. No matter what you’re goals are: Time is running out. Let’s roll. Thoroughly enjoyed your presentation. Reminds me of the fabulous job you did at Poynter – you’re not only exceptionally bright in your craft, but you communicate your ideas and sentiments well. At Princeton University today for Ivy Sports Summit. Hey, with all your brilliance & academic pedigrees, weren’t you here at least once:)??? This is moving, genuine, powerful and leaves me wanting to stand and cheer who you are and what you bring. I was googling to find the words of the “your own oxygen mask” airline quote, and found your site. Wow, it is *beautiful*, I love it!!! I assume (but am asking if) it is alright to share this e.g. on Facebook? It relates perfectly to some conversations on my page. (And to that-thing-we-call-life.) Thanks for a wonderful read!